There are times when yoga seems to be taken as a rather serious practice. 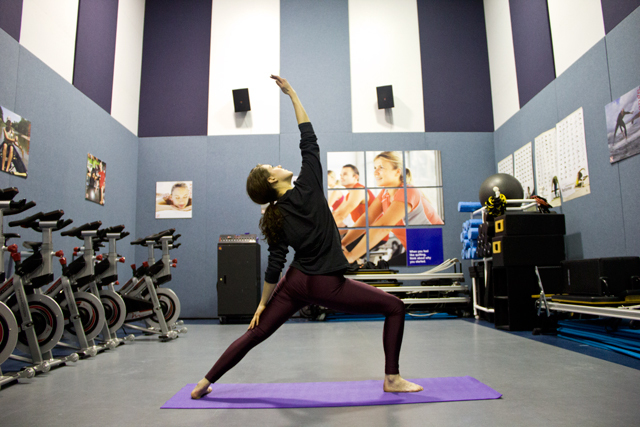 Although there are certain yoga classes that do reflect it, it is simply not the case when Liza Thalken, a senior psychology major, is the instructor. In her class, anyone who somehow feels intimidated right away can breathe easier, literally. “Don’t be loose-banana monkeys; be six-pack ab monkeys. Don’t be afraid to make a Darth Vader-like noise when you breathe out. No one here is going to judge you,” stated Liza. The senior psychology major teaches “Yoga for Athletes” weekly on Thursdays 7pm at the Campus Recreation Center in the University of Nebraska-Lincoln. However, one should not simply be intimidated by the name straightaway. It is in fact a rather relaxed form of yoga. The class actually aims to be a restorative practice and focus specifically on both stretching and injury prevention. The average weekly attendance ranges between ten to fourteen students. “So far, there has been consistently about 13 people, which is good because otherwise, it would be awkward with the space issue,” admitted Liza. Liza’s younger sister, Rosamond Thalken, who is a freshman biology major, mentioned that she enjoys going for her sister’s class on a weekly basis. “I really like going to Liza’s class because all of the moves are restorative and relaxing while also still being a challenge. It’s also really nice to have a smaller, more personal class setting,” she explained. Currently, the classes take place in the Studio at the Rec. Even though it can be cramp at times, Liza always tries to search for a way in adjusting the mats so that she can cater to anyone who wants to attend the class. By having a smaller group size, it also enables the Kearney native to practice her own teaching skills, as she only recently received her Level One certification. Liza mentioned that after she graduates, she has hopes of moving over to Colorado. Although she is still taking into consideration working on a master’s, her main goal is still to continue teaching yoga. “I would just like to save up money and keep going to these yoga certification classes and keep just experiencing the world of yoga. The main problem is that it’s really pricey, but that’s because it’s really good quality stuff,” she explained. For the rest of the story, do read it here. For those of you who might be looking for private yoga classes in Singapore, look no further! OMG Yoga offers you affordable yoga classes that are taught by certified yoga instructors from Yoga Alliance-recongised schools.